The common complaint with Army issue guns is that they are made by the lowest bidder. South Korean K5 (P51 in the commercial dress) is no exception. Back when Korean Daewoo P51 pistols became available in the US, I didn’t pick one up. I wasn’t sure what niche it filled and didn’t have a chance to try one out. The guns were milspec (it’s used as the officer sidearm in the South Korean Army) and looked the part. Recently, I discovered that Daewoo is building rather higher-grade variants for Lionheart Industries. They sell three LH9 models, standard, compact and mk2 (with an accessoryy rail). The pistols are Cerakoted, have options of tritium night sights or fiber optics, and generally look worth using. The guns have an interesting trigger mechanism — it can be carried cocked and locked, hammer down for double action first shot or in “fast action” mode — with the hammer first cocked, then pushed forward. The trigger pull is then similar to Para Ordnance LDA — long but very light and smooth. The pistol frame is aluminum alloy, so the overall weight is 800g vs. 1kg for Browing Hi-Power (same 105mm barrel length and 13-round magazine capacity). I have not fired the pistols I have here yet, so a range report is coming later. I like the feel and the balance, like the anti-glare texture on top of the slide and the trigger. It has no magazine disconnector. I am not wild about the way the safety works: it disconnects the trigger, so it can be pulled with no effect. I would have like a CZ/1911 type safety that arrests the trigger motion better for the sake of more obvious tactile feedback. The gun comes in a zip-up soft case with spare magazine, cleaning tools and other accessories: the first impression is very classy. It helps that GCode offers a variety of holsters for LH9: I consider them to be among the best Kydex designs made. Found a detailed review that you might enjoy reading. 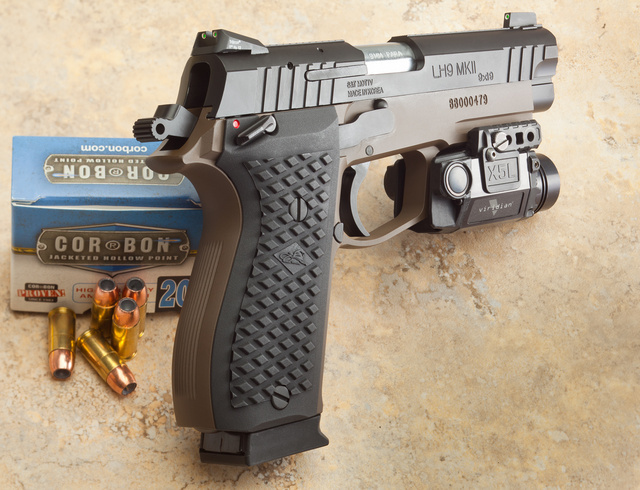 This entry was posted in light/laser, pistol, weapon and tagged 9x19, Viridian. Bookmark the permalink. And where would you find reloading tables in metric? Is there such a thing as reloading outside the USA? The safety hinging in the front “looks” awkward. How does it compare to a 1911 which is possibly the most natural and intuitive manual safety there is? Looks a bit like a love child of a Keltec PF-9 and a 1911, where the kid got the pretty parts of both. 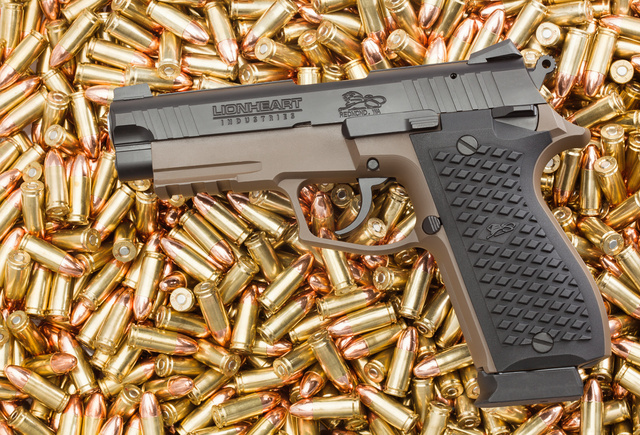 On first glance,I told myself: yet another Sig-Sauer clone.. I had the DH51 back when we lived in CA. When I moved to AZ and got a CCW, I sold it because it was too large for me to carry concealed. However, it was the sweetest shooting pistol I have ever owned. The long sight radius, quality fitment, and super slick trigger were the ticket for very tight groups. The triple-action, hammer pushed forward, was THE way to carry – super safe, but ready for an easy long squeeze never wavering off the “X”. I will have to look for the LH9 or mk2 in our “local” shops. If it is as good as the full-size, it might find a place in the arsenal. Check the dealer locator at LionheartIndustires.com. 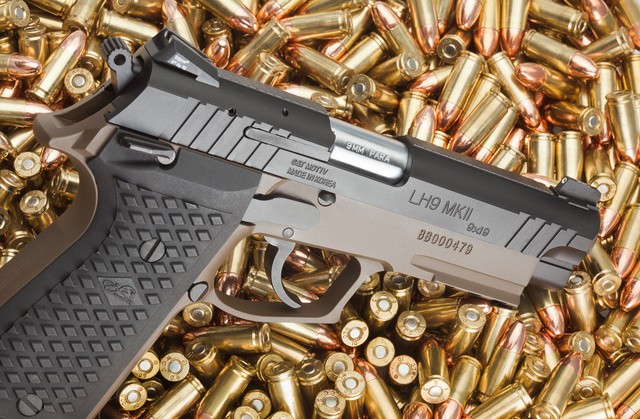 You can also buy direct and have it shipped to your local FFL … at full MSRP, but free shipping. Trigger disconnect safeties are vastly safer, especially when trigger jobs are involved. I still have the DH-40 I bought back in 94 just after the AWB passed. The only complaint I ever had was that they didn’t make the barrels interchangeable with the DP-51 (allowing for a .40 s&W/9mm swap capability). The ‘tri-action’ trigger is indeed slick, and raises many an eyebrow when first seen in action. As for the safety…I can’t speak for anyone else, but my experience has been that it is the *knuckle* of the thumb that engages the lever, not the meat of the tip as on a 1911. It sounds awkward, but once you get the muscle memory in there, it’s every bit as natural as any other safety. On my DH-40 the safety seems a little ‘gritty when engaging, but *disengages* with a crisp ‘snap’ into place. I’ve had a DP-51 for years and while it does look a little rough in several places including the bore, this one example is thoroughly reliable. 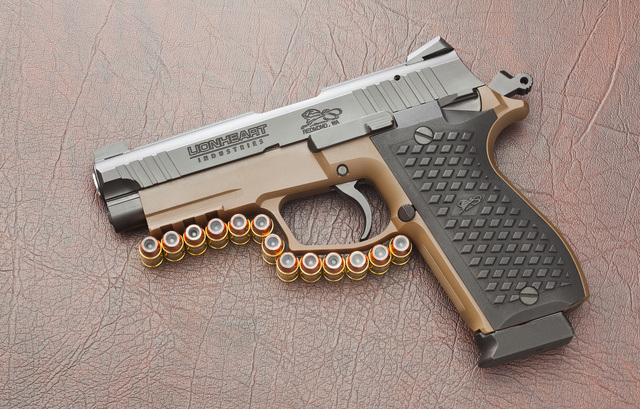 Looks to be the perfect companion pistol to the Kel-Tec Sub-Rifle 2000 in 9mm fitted for S&W 59 magazines…. I’m not sure what could have been lacking in the earlier imported Daewoos. I’ve got a DH40 from 2002 that has more traditionally checkered grips and slide serrations, and lacks the forward slide serrations; but it has the same grooves on the front and backstrap and the same wavy stippling on the top of the slide. It had very nice bluing on the slide and the frame anodized a pleasing dark grey. The fit and finish is as good as anything I’ve seen in a mass market pistol – very smooth with zero toolmarks. I played with one at the gun shop I worked at when the first Daewoo DP pistols came out, and I liked them…but then they faded off the radar. Glad to see they are back, nifty little guns.